Expanded repeats in the ataxin-2 gene heighten ALS risk in a handful of people, but antisense therapy to knock down the gene’s expression could, potentially, offer a treatment for the majority of patients, according to a preclinical study in the April 20 Nature. The research, led by Aaron Gitler at the Stanford University School of Medicine in California, found that treatment with an ataxin-2 antisense oligonucleotide (ASO) extended the lifespan by one-third in mice expressing the human version of the RNA-binding protein TDP-43. Testing in other models of ALS is now underway. These aggregates are present in more than 95% of cases of ALS suggesting, according to Gitler, that this anti-ataxin-2 approach may be a treatment strategy for most forms of ALS, including sporadic disease (Mackenzie et al., 2007). Gitler’s team first reported in 2010 that ataxin-2 polyglutamine expansions are associated with ALS risk (Elden et al., 2010), and scientists have confirmed that finding in several populations (Lee et al., 2011; Daoud et al., 2011; Sorarù et al., 2011). Specifically, CAG repeats numbering 31-33 increase ALS risk by a factor of two to six, according on one meta-analysis (Neuenschwander et al., 2014). Longer versions are associated with spinocerebellar ataxia. The intermediate-length repeats are present in about 5% of people with ALS. How changes in ataxin-2 may contribute to the onset of ALS remains unclear (see July 2012 news). However, down-regulating or deleting ataxin-2 mitigates TDP-43 toxicity in yeast and fruit fly models, suggesting its reduction might be therapeutically beneficial (Elden et al., 2010). 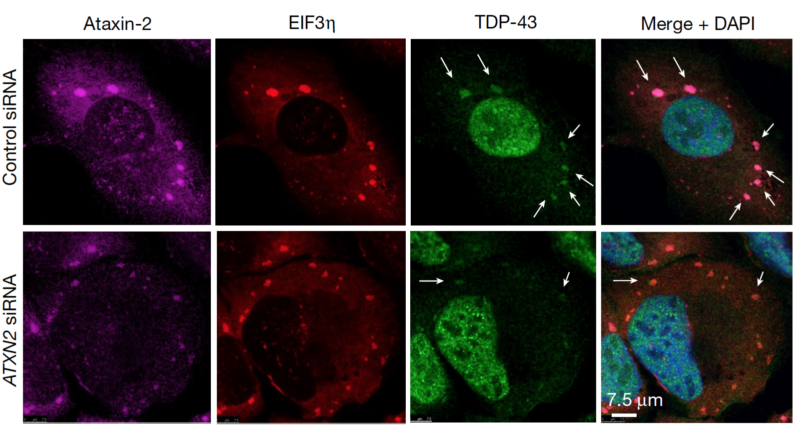 To further explore the potential of this approach, first author Lindsay Becker tried it in a mouse model of ALS expressing wild-type human TDP-43 in the nervous system (Wils et al., 2010). Like the majority of human ALS cases, these animals have TDP-43 inclusions in some of their neurons. They typically lose the ability to walk around 21 days of age. But by crossing these mice with ataxin-2 knockouts, the researchers drastically diminished that phenotype. The ataxin-2-knockout mice were still walking when, after 29 days, all the control TDP-43 mice had been euthanized. Several of the mice lived for 400 days or more, according to the study. The researchers suspected that these benefits might result from changes in stress granules, storage conglomerates of RNA and protein that cells assemble to conserve resources when times get tough. Stress granules appear to persist in ALS (Kim et al., 2014). And, aggregation-prone proteins such as TDP-43 land in stress granules according to a growing number of studies, promoting the formation of potentially pathological inclusions in the disease (Ramaswami et al., 2013; Li et al., 2013). 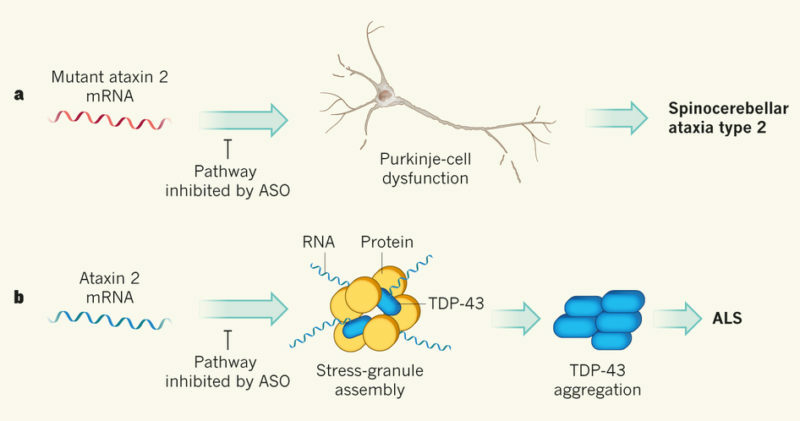 Ataxin-2 regulates the assembly of stress granules, so Becker and colleagues hypothesized that lowering ataxin-2 reduced TDP-43 aggregation and thereby motor neuron toxicity (Nonhoff et al., 2007; Kaehler et al., 2012). Indeed, deleting ataxin-2 resulted in 45 or 75% fewer TDP-43 aggregates in brain and spinal cord samples, depending on which antibody the scientists used. They observed similar effects in cultured cells with lowered ataxin-2. Together, the results suggest that knocking out ataxin-2 may extend the survival of a mouse model of ALS by reducing the recruitment of TDP-43 to stress granules and thereby, the build-up of TDP-43 aggregates in the brain and spinal cord. Therefore, lowering ataxin-2 levels may indeed be a potential treatment strategy for ALS. To test this idea further, with a method that could be applied in people, Gitler’s team collaborated with Ionis Pharmaceuticals in Carlsbad, California to try antisense oligonucleotides targeting ataxin-2. The company’s antisense treatment just scored a major win in a trial for spinal muscular atrophy (see November 2016 news), and antisense trials are also underway for neurodegenerative conditions such as SOD1-mediated ALS and Huntington’s disease. Also in the April 20 issue of Nature, Ionis and collaborators report success treating a mouse model of spinocerebellar ataxia with anti-ataxin-2 ASOs. Stanford University’s Brenda Huang administered the ASO by intracerebroventricular injection into TDP-43 mice at day one of age. Median lifespan increased by 35%, with two of the treated animals surviving for more than four months. Motor abilities also lasted longer in the treated mice. The authors scored the animals’ walking abilities at 21 days, on a scale of 0 (no disability) to 4 (unable to right itself). While untreated mice averaged scores between 2 and 3, the ASO-treated animals typically scored below 2. A potential treatment for sporadic disease? The results are promising, according to Jeffrey Rothstein of Johns Hopkins University in Baltimore, who penned a commentary on the paper for Nature. But he said more work needs to be done to determine whether this strategy could be of benefit to human patients, and in which forms of the disease. He is eager to see results from ataxin-2 knockdown studies in other models of ALS, such as transgenics that carry disease-linked repeats in the C9ORF72 gene and thus represent the diseases’ root in a large proportion of people. Frank Rigo of Ionis Pharmaceuticals, a co-author on the study, said the company plans to further evaluate this potential treatment strategy preclinically in other mouse models of ALS as well as patient-derived stem cell models. The catch, mentioned Gitler, is that so far neuroscientists aren’t sure what to measure in the cell cultures that would indicate therapeutic efficacy in patients. Ben Wolozin of the Boston University School of Medicine, who did not participate in the study, marveled at the survival benefit in TDP-43 mice upon ataxin-2 knockout or ASO treatment. However, he noted that the reduction in TDP-43 pathology was less impressive. In the ataxin-2 knockouts expressing TDP-43, at least 25% of TDP-43 aggregates remained in the brain and spinal cord, which could contribute to disease. Perhaps, he speculated, the knockdown of ataxin-2 worked by some other mechanism in addition to reducing stress granule maturation. Both Wolozin and Gitler suggested that other stress granule components, too, might be effective targets for aggregate-busting therapeutics. A key step en route to clinical trials, Rothstein noted, would be some way to monitor ataxin-2 knockdown in patient tissues. Such a biomarker of target engagement has recently been introduced by Leonard Petrucelli for C9orf72 ALS, and according to Biogen’s Steve Han, is going to be used to help evaluate RNA repeat-targeted oligonucleotides in an upcoming phase 1 clinical trial (see March 2017 and April 2017 news; Gendron et al., 2017). Another crucial question is which patients would be likely to benefit from anti-ataxin-2 ASOs or other treatments. Since TDP-43 pathology is so common, Gitler and Rigo hope that the treatment could benefit anyone with sporadic ALS, no matter the size of their ataxin-2 gene. Rothstein also was uncertain if reducing ataxin-2 levels would benefit a person with normal-length repeats, but nonetheless upbeat: “There’s no question, I think, if it can, this should go to clinic,” he said. Elden AC, Kim HJ, Hart MP, Chen-Plotkin AS, Johnson BS, Fang X, Armakola M, Geser F, Greene R, Lu MM, Padmanabhan A, Clay-Falcone D, McCluskey L, Elman L, Juhr D, Gruber PJ, Rüb U, Auburger G, Trojanowski JQ, Lee VM, Van Deerlin VM, Bonini NM, Gitler AD. Ataxin-2 intermediate-length polyglutamine expansions are associated with increased risk for ALS. Nature. 2010 Aug 26;466(7310):1069-75. [PubMed]. Lee T, Li YR, Ingre C, Weber M, Grehl T, Gredal O, de Carvalho M, Meyer T, Tysnes OB, Auburger G, Gispert S, Bonini NM, Andersen PM, Gitler AD. Ataxin-2 intermediate-length polyglutamine expansions in European ALS patients. Hum Mol Genet. 2011 May 1;20(9):1697-700. [PubMed]. Daoud H, Belzil V, Martins S, Sabbagh M, Provencher P, Lacomblez L, Meininger V, Camu W, Dupré N, Dion PA, Rouleau GA. Association of long ATXN2 CAG repeat sizes with increased risk of amyotrophic lateral sclerosis. Arch Neurol. 2011 Jun;68(6):739-42. [PubMed]. Nonhoff U, Ralser M, Welzel F, Piccini I, Balzereit D, Yaspo ML, Lehrach H, Krobitsch S. Ataxin-2 interacts with the DEAD/H-box RNA helicase DDX6 and interferes with P-bodies and stress granules. Mol Biol Cell. 2007 Apr;18(4):1385-96. [PubMed]. Kaehler C, Isensee J, Nonhoff U, Terrey M, Hucho T, Lehrach H, Krobitsch S. Ataxin-2-like is a regulator of stress granules and processing bodies. PLoS One. 2012;7(11):e50134. [PubMed]. 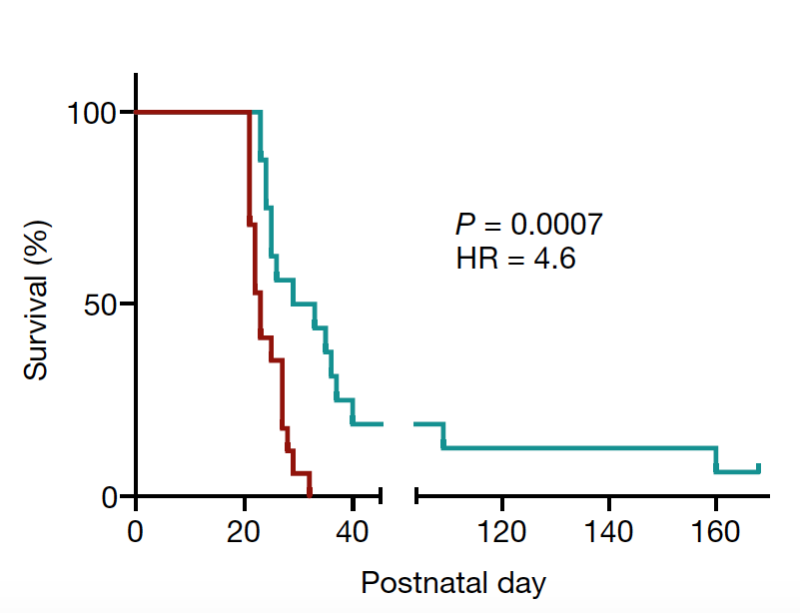 Sorarù G, Clementi M, Forzan M, Orsetti V, D’Ascenzo C, Querin G, Palmieri A, Ermani M, Angelini C, Pegoraro E. ALS risk but not phenotype is affected by ataxin-2 intermediate length polyglutamine expansion. Neurology. 2011 Jun 7;76(23):2030-1. [PubMed]. Neuenschwander AG, Thai KK, Figueroa KP, Pulst SM. Amyotrophic lateral sclerosis risk for spinocerebellar ataxia type 2 ATXN2 CAG repeat alleles: a meta-analysis. JAMA Neurol. 2014 Dec;71(12):1529-34. [PubMed]. Wils H, Kleinberger G, Janssens J, Pereson S, Joris G, Cuijt I, Smits V, Ceuterick-de Groote C, Van Broeckhoven C, Kumar-Singh S. TDP-43 transgenic mice develop spastic paralysis and neuronal inclusions characteristic of ALS and frontotemporal lobar degeneration. Proc Natl Acad Sci U S A. 2010 Feb 23;107(8):3858-63. [PubMed]. Gendron TF, Chew J, Stankowski JN, Hayes LR, Zhang YJ, Prudencio M, Carlomagno Y, Daughrity LM, Jansen-West K, Perkerson EA, O’Raw A, Cook C, Pregent L, Belzil V, van Blitterswijk M, Tabassian LJ, Lee CW, Yue M, Tong J, Song Y, Castanedes-Casey M, Rousseau L, Phillips V, Dickson DW, Rademakers R, Fryer JD, Rush BK, Pedraza O, Caputo AM, Desaro P, Palmucci C, Robertson A, Heckman MG, Diehl NN, Wiggs E, Tierney M, Braun L, Farren J, Lacomis D, Ladha S, Fournier CN, McCluskey LF, Elman LB, Toledo JB, McBride JD, Tiloca C, Morelli C, Poletti B, Solca F, Prelle A, Wuu J, Jockel-Balsarotti J, Rigo F, Ambrose C, Datta A, Yang W, Raitcheva D, Antognetti G, McCampbell A, Van Swieten JC, Miller BL, Boxer AL, Brown RH, Bowser R, Miller TM, Trojanowski JQ, Grossman M, Berry JD, Hu WT, Ratti A, Traynor BJ, Disney MD, Benatar M, Silani V, Glass JD, Floeter MK, Rothstein JD, Boylan KB, Petrucelli L. Poly(GP) proteins are a useful pharmacodynamic marker for C9ORF72-associated amyotrophic lateral sclerosis. Sci Transl Med. 2017 Mar 29;9(383). [PubMed]. Li YR, King OD, Shorter J, Gitler AD. Stress granules as crucibles of ALS pathogenesis. J Cell Biol. 2013 Apr 29;201(3):361-72. [PubMed]. Ramaswami M, Taylor JP, Parker R. Altered ribostasis: RNA-protein granules in degenerative disorders. Cell. 2013 Aug 15;154(4):727-36. [PubMed].